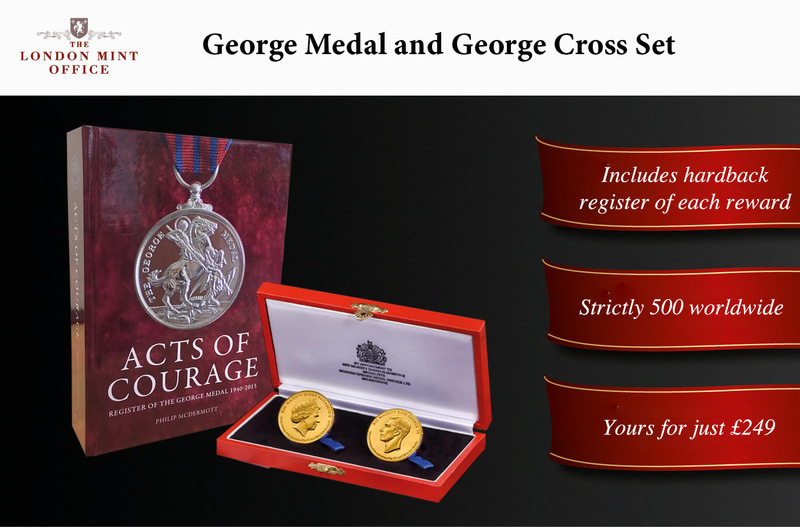 Own a George Medal and George Cross commemorative set, beautifully crafted in bronze and layered in pure gold, in honour of those who have been awarded them for acts of bravery over the last three-quarters of a century. Struck to a Brilliant Uncirculated finish and crafted by Worcestershire Medal Service, medallists to Her Majesty the Queen, the designs depict in superb detail the distinctive original designs of the medals themselves. The accompanying 800-page hardback book has a handsigned foreword by Lt. Col. JRT Balding MBE GM, recipient of the George Medal and President of the Gallantry Medallists’ League, a charity that benefits from a percentage of all sales. • Includes a free individually hand-signed 800-page hardback book, ‘Acts of Courage’, edited by Phil McDermott.